Pitt’s Student Government Board on Tuesday said it wants to make its own version of RateMyProfessor that won’t let any faculty member miss out on being reviewed. SGB member Joseph Kannarkat announced at last night’s meeting that he plans to propose making the OMET results public and imagines students could use the results a lot like the website RateMyProfessor. He hopes the surveys, which he plans to be in an online database, will be more constructive than RateMyProfessor, which ranks professors based on likability, attractiveness and class difficulty. Right now, only department heads and faculty can view the anonymous results of the OMETs that students submit at the end of each semester. Kannarkat said he will meet with the Associate Dean for Undergraduate Students John Twyning on Friday to discuss the project. Although Kannarkat does not yet have a timeline for the project, he does not expect that the OMETs at the end of the current semester will be public. SGB first proposed this initiative in 2010. In 2013, then board member Tom Jabro and Academic Affairs Committee Chair Nuwan Perera collected 550 signatures to petition for OMET results being made public, The Pitt News reported. That January, SGB met with members of the University Faculty Senate’s Educational Policies Committee, who had already been deliberating the move for about a year. The Committee decided to leave the decision up to individual schools. From there, Perera took up the idea with the administrations from the Swanson School of Engineering, who thought making the multiple choice section of the survey would hold professors accountable but did not want to publish the open ended section. Now, Kannarkat is hoping to work with the Dietrich School of Arts and Sciences to make OMET surveys public. He said if the Dietrich School participates, he believes other schools will as well. Kannarkat said the Dietrich School may be more willing to work with him than schools in the past because making the OMET public could increase student participation, something OMET administrators have struggled to do in past years. With more students providing reviews, the results would become more informative for both students and faculty. Often, department heads will use these surveys to evaluate faculty and determine whether or not they should receive tenure. Each school or department approves the standard OMET survey it distributes, and the surveys cannot be altered without permission by the administration of the school or department. For students, the survey could be an opportunity to learn how other students responded to that faculty member’s teaching style. Since all the surveys are done online, the results for each faculty member are already organized together. Making the OMETs public may also lead to an increase in OMET participation, according to Kannarkat. Kannarkat said he has emailed back and forth with Twyning, who says he is interested in the project, but he is not sure what form it will take. “The meeting Friday with Twyning will give a better idea of what we think this would entail and how it would look,” Kannarkat said. 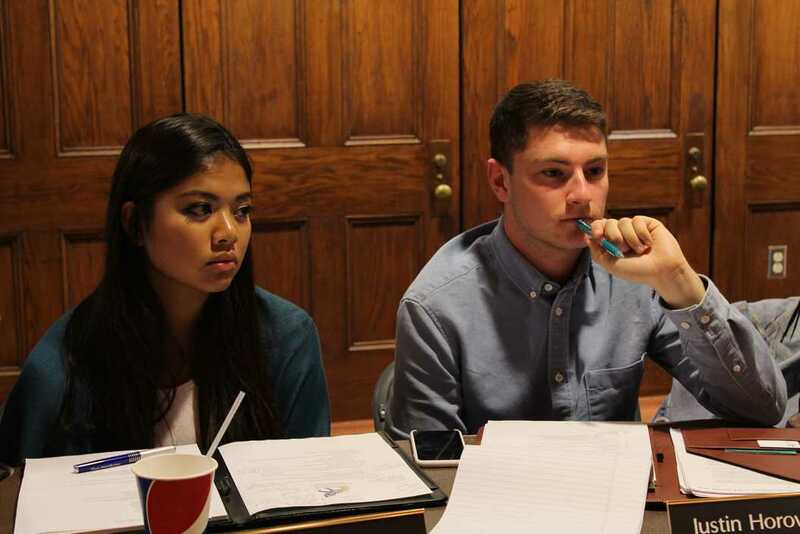 In other news, Board member Justin Horowitz announced that starting next week, student groups will be able to post announcements and messages on a whiteboard in the William Pitt Union as part of his whiteboard broadcasting project. The project will place a board in the WPU stairwell leading from the Schenley Quad entrance to the lower level. Student organizations can sign out markers from Nordy’s Place to post announcements on the board. Horowitz said he is waiting on approval to use the Pitt script logo, and then he plans on ordering the board this week. WPU staff will monitor the whiteboard throughout the day in order to ensure that the information is still relevant and that students do not post their own personal messages on the board. “This is really a test run, and ultimately, if it works, I want to implement it in a lot of the other buildings on campus,” Horowitz said. Once Horowitz orders the whiteboard, he will send out an email to the student organizations on campus describing the project and its guidelines. As soon he gets the board, Horowitz will have it set up in the WPU, and organizations will be able to use it for their announcements. Following last week’s proposed revisions to the SGB Governing Code, SGB approved the changes and announced that the actual budget for the 2016-2017 academic year is $53,750.23. Steve Anderson will continue to serve as adviser to SGB with oversight of the budget. Pitt Student Slovak Club requested $1,950.00 for honorarium fees for their twenty-sixth annual Slovak Festival. The Board moved to approve the request in full. The Pitt chapter of the American Institute of Chemical Engineers requested $2,612.00 for lodging, airfare and admission to attend the annual student conference in San Francisco. The Board initially denied this request in full because of the individual responsibility by students presenting research. After some discussion, the Board agreed to approve funding for $1,642.00 for two members to attend. Engineers Without Borders requested $2,195.29 for fees, lodging and airfare to attend the Northeast Regional conference. The Board approved $1,981.30.